Board your dog with us to discover the Dogtopia difference! 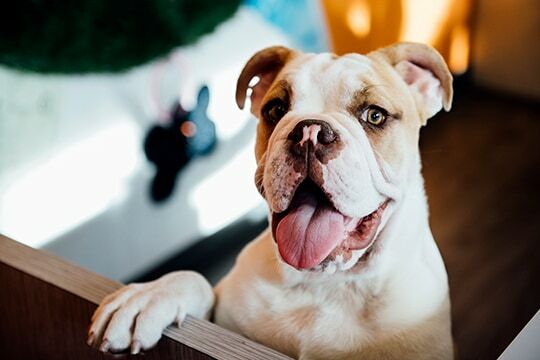 Dogtopia of White Flint offers a number of boarding options, whether you’re just looking to leave your dog overnight or for an extended period of time. Dogtopia of White Flint’s convenient central location provides the ideal location if you’re looking to drop your dog off before heading out of town. We are close to all the area’s major routes, including 355 South. We’re also close to Kensington, Rockville and the Garret Part area. Since 2006, we’ve become known for providing the best dog boarding services in the community. Unlike other dog boarding facilities, your pup will enjoy freedom in our open play areas. The only times dogs are crated is during meal time, a well-deserved nap in the afternoon, and overnight. Boarding dogs enjoy up to 10 hours of play every day with our daycare dogs. Your pup will have a paw-some time with their new FBFFs (furry best friends forever). Our boarding guests sleep in comfortable home style crates. We encourage our clients to bring a favorite blanket, piece of bedding or non-squeak toy. Your dog may get homesick and having something familiar allows them to bring a piece of home with them. Bringing your dog’s regular food is also recommended, but we also stock Blue Buffalo’s dog food in our lobby at an affordable price. Choose from a full range of flavors! Your pup may not be the only one suffering from separation anxiety. Not to worry! All three of our playrooms come equipped with webcams. Check in on your dog at any time during regular business hours. You’ll enjoy peace of mind while you laugh at your dog’s antics with the other dogs and our playroom attendants. At Dogtopia, your dog’s safety is our number one priority. Each of our playrooms is supervised by our highly trained attendants. We also require that all dog parents who want to board their dogs with us schedule a meet and greet with our team. This allows us to decide if your dog is the right fit for our open play environment. Think of your dog staying with us as a vacation. What vacation would be complete without a day at the spa? Dogtopia offers spa services as part of our boarding packages. When you pick your pup up they will be clean and happy to see you. Our team will see to them being pampered in our relaxing, fully-equipped spa. Visit our pricing page or contact us to find the dog boarding package this is right for your dog and your budget. We created packages that were designed to fit any budget. We know the importance of being able to afford to leave your dog with us. Boarding space is limited so we recommend booking in advance to avoid disappointment.